KAITHAL, March 15  The Indian National Lok Dal President Mr Om Prakash Chautala, has urged the Central government to implement the Eradi Tribunal Award without any further delay and ensure that Haryana got its due shares in Ravi, Beas waters. PEHOWA, March 16  Over four lakh pilgrims today took a dip in the waters of the holy Saraswati Tank on the occasion of Chaitra Chaudas. Ninety per cent of the pilgrims were Sikhs hailing from the districts of Ropar, Fatehgarh Sahib, Patiala, Sangrur, Bhatinda, Faridkot and parts of Ludhiana district. HISAR, March 16  Guru Jambeshwar University, here is yet to get a regular vice-chancellor, ever since the retirement of Prof K.L. Johar on October 20 last. Currently the Commissioner, Hisar division, Mr Dharamveer, is holding the additional charge of the VC. ROHTAK, March 16  At least 26 persons were injured, one of them seriously, when a bus overturned after colliding with a truck near Samar-gopalpur village on the Jind road, 15 km from here, this morning. FATEHABAD, March 16  Owing to consecutive crop failures, and incidents of some traders running away with farmers payments, the commission agents of the local grain market are facing the worst ever financial crises. HISAR, March 16  Hundreds of farmers from Haryana, Punjab, Rajasthan, Delhi and Uttar Pradesh thronged the kisan mela which began here today at CCS Haryana Agricultural University. HISAR, March 16  The Bahujan Samaj Party today ruled out any political alliance or understanding with the Indian National Lok Dal. ROHTAK, March 16  The Union Government has reportedly sanctioned a grant of Rs 13.27 crore to Haryana for providing compensation to farmers whose standing crops were badly damaged by the unseasonal rains last year. KURUKSHETRA, March 16  Jagjit Singh Virk, president of the Haryana State Sikh Forum, here today expressed fear that Sikhs in Haryana would have to think about making separate arrangements for the maintenance and upkeep of gurdwaras in the state if the infighting between the SGPC and the SAD did not stop. KAITHAL, March 15  The Indian National Lok Dal President Mr Om Prakash Chautala, has urged the Central government to implement the Eradi Tribunal Award without any further delay and ensure that Haryana got its due shares in Ravi, Beas waters. Addressing a press conference yesterday he said though the Centre was boasting of solving the Krishna-Kaveri waters dispute, it was not taking any step to resolve the outstanding waters dispute between Punjab and Haryana. He said that the BJP-led Central Government was in a comfortable position to resolve it as it was a coalition partner in governments of both Punjab and Haryana. While criticising the statement of Punjab Chief Minister Mr Parkash Singh Badal, that Punjab had no surplus water for Haryana and there was no need to construct the SYL canal. Mr Chautala urged the Centre to hand over the construction of remaining portion of SYL canal to the Border Roads Organisation, so that Haryana could get its rightful share of 5.83 m.a.f. as per the Eradi Tribunal award. He said Haryanvis demanding its share of water not as a charity, but as a matter of right. He regretted that due to availability of excess water in Punjab, it was facing waterlogging problem, at the same time scarcity of water caused drought like conditions in many parts of Haryana. He also expressed his anguish over the fact the surplus Ravi, Beas waters were flowing to Pakistan, but were not being given to Haryana, which needed it badly for its economic development. He called it as national loss. Mr Chautala appealed to all the political leaders of Haryana to discuss this issue in the interest of the state. He demanded a special session of Assembly to discuss the tribunal award issue. He took to task the Chief Minister, Mr Bansi Lal, for not paying any compensation to farmers who had suffered heavy losses during the last untimely rains and floods. He also said that claim of Mr Bansi Lal to provide 24-hour power supply in Haryana from July 1, was a big joke and said that the state government had promised to complete repairs of roads by March 31, but it has failed to fulfill its promise. The pilgrims starting thronging the 8000 year old historic town of Pehowa earlier known as 'prithudak' since yesterday itself. After alighting from special buses being run by both Punjab and Haryana they made a beeline to the banks of the sacred tank. Pilgrims jostled in the narrow bazaars of the ancient town to have a dip. After the dip in the tank waters, which had been recently filled, pilgrims could be seen offering "pind" to their departed ancestors on the banks of the tank. Hundreds of pandas also reached the town and have taken vantage positions on the banks to help pilgrims to make offerings to their departed ones. The air at the Saraswati Tank Sreverberated with Sanskrit shlokas recited in the memory of the dead ancestors. It was a scene of solemn religiosity when each pilgrim after the dip sat for offering pind. Some pandas have organised havans, while others could be seen advising the pilgrims to lighten earthen lamps of mustard oil to please the departed souls. After that the pilgrims offered threads and tied it with a peepal tree known as "preyat peepal". The ceremony is considered incomplete without it. Amongst the pandas, a large number of them were from Western U.P. who come here to make a quick buck. Mahant Bansipuri of the historic Preetheswar Mahadev Mandir demanded that the administration should provide licences to the pandas who come from outside after verifying that they were well conversant with the ancient method of "pind daan". Hundreds of beggars were sitting on either side of the lanes and bylanes leading to the sacred sarovar. The administration had opened some fair price shops but these were too short to meet the requirements of the pilgrims for pure and cheap eatables. Religious organisations have organised langar for pilgrims. After the Pehowa visit, pilgrims in hundreds made a beeline to the religious teerathbas of Kurukshetra. Over one lakh had a holy dip in the Brahmsarovar today. The Chaitra Chaudas bath is likely to continue till midnight. The government appears in no hurry, despite the fact it has already amended the university Act in accordance to the University Grants Commission guidelines for appointing the vice-chancellor. Earlier, it was the Governor who would appoint the VC on the recommendation of the state government. But the new statute provides for the constitution of a search committee, which will recommend a three-name list to the Governor. It was during the last session of the Assembly that the government amended the university Act. But so far there are no indications that the government might be planning the constitution of a search committee for the appointment of the VC. The Executive Council of the university, which is likely to meet in the last week of this month or in the first week of the next month, has not on its agenda the constitution of the search committee. Despite the absence of VC, the university has managed to make some positive strides. The current VC has been instrumental in establishing the most modern and well equipped computer centre. The computer centre will be inaugurated by the Governor and the Chancellor of the university, Mr Mahabir Prasad on March 19. The computer centre has 80 personal computers, of which 20 are networked. Internet facility will also be made available on those 20 terminals for the use of teachers and students. Unlike other universities, the GJU is installing its own V-SAT connectivity. This would also ensure speedy and economical access to Internet. The V-SAT is being installed by the Department of Electronics, Government of India. Meanwhile, the faculty association of the university has welcomed the decision of the vice-chancellor to provide accommodation to single teachers in the university Faculty House. They have also hailed the VC's decision to take up the cases of confirmation of some teachers against whom court cases were pending. In a similar case Prof C.P. Kaushik, a senior professor of the university, has been awaiting confirmation as there is a case pending against him regarding his eligibility. The university has reportedly admitted in the court that Prof Kaushik does not have the required experience. The matter is likely to be decided in the EC meeting of the university. However, a spokesman for the university, clarified that the confirmation cases would be decided on the basis of merit only. According to police sources, the bus belonging to a cooperative society was going to Rohtak from Samargopalpur when the truck collided with the bus making it overturn in the fields. The injured have been admitted to the PGIMS hospital here. Meanwhile, in another incident, the police has booked a case against five members of a family at Model town here in connection with alleged harassment for more dowry. A case has been registered under Sections 498-A and 406, IPC, against them. However, no arrests have been made so far. FATEHABAD, March 16  Owing to consecutive crop failures, and incidents of some traders running away with farmers payments, the commission agents of the local grain market are facing the worst ever financial crises. The local grain market enjoyed a prominent status in the markets of the region. 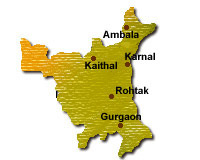 The Fatehabad area, it may be learnt, is considered to be the cotton belt of Haryana. People involved in agriculture-related jobs are well off here, due to good agricultural production during the past many years. As a result traders of the local grain market have also had a good business. But a sharp decline in the production of cotton and other cash crops during the past few years has hit the traders. The fleeing of some millers and big traders of the area with huge amounts of these traders has generated an atmosphere of mistrust in the market. There has been a sharp decline in the production of cotton during the past five years. Attacks of American bollworm and leaf curl on the crop is said to be the main reason. Water-logging being the other. According to reliable sources, almost each of the 200 odd commission agents in the local grain market has lent big amounts to farmers. Due to recurring crop failures the farmers have been indebted more than double of their normal paying capacity. HISAR, March 16  Hundreds of farmers from Haryana, Punjab, Rajasthan, Delhi and Uttar Pradesh thronged the kisan mela which began here today at CCS Haryana Agricultural University. This time, the theme is "Integrated pest management in crops". The two-day mela was inaugurated by Mr Jagan Nath, Agriculture Minister, Haryana. Expressing satisfaction with the present agricultural output of 114 lakh tonnes, the Minister said that there was scope for further improvement. He appreciated the role of CCSHAU in improving the agriculture economy. Speaking on the occasion, the Vice-Chancellor, Prof. J.B. Chowdhury highlighted importance of the Kisan Mela in giving farmers knowledge of the latest developments in farm technology, and scientists the chance to interact with farmers. He urged farmers to monitor and adopt developments in farm technology and follow integrated pest management practices. These practices are effective and ecofriendly, he pointed out. An agro-industrial exhibition was also put up at the mela, where over 150 public and private sector companies displayed their products including farm machinery, agro-chemicals, seeds and time and energy saving devices. On the occasion the Agriculture Minister released a book on 'Storage of Grains' authored by Drs Manju Singh, Rachna Ghulati, Anita Punia and Bhawna Sareen of the Zoology Department. HISAR, March 16  The Bahujan Samaj Party (BSP) today ruled out any political alliance or understanding with the Indian National Lok Dal (INLD). Reaching to a statement by INLD leader Ajay Chautala that his party might join hands with the BSP, state BSP general secretary Pradeep Chaudhary said his party had a bitter experience with the INLD in the past. Mr Chaudhary claimed that the BSP helped the INLD (then the Haryana Lok Dal Rashtriya) to win four parliamentary seats in the 1998 elections, but the party (INLD) betrayed the alliance by extending unconditional support to the BJP-led coalition government at the Centre, much against the wishes of the BSP. He said although the party had not closed its options on future alliances, it was certain that an understanding with the INLD "was most unlikely as it had betrayed us in the past at crucial moment". He did not rule out his party going it alone in the next elections. ROHTAK, March 16  The Union Government has reportedly sanctioned a grant of Rs 13.27 crore to Haryana for providing compensation to farmers whose standing crops were badly damaged by the unseasonal rains last year. According to highly placed sources, a decision to this effect has been taken at a recent meeting of the National Calamities Relief Committee headed by Mr Krishan Chand Pant, vice-chairman of Union Planning Commission and a former Defence Minister. It may be recalled that the state government had sought a compensation of Rs 739.92 crore in a memorandum to the central survey team who visited the affected villages in October last. Meham (Rohtak), Beri (Jhajjar) and Julana (Jind) were the worst-affected areas with standing crops spread over thousands of acres destroyed. And a large number of farmers could not sow a rabi crop due to waterlogging. Activists of Meham Chaubisi Jansangthan and the Lok Dal had blocked traffic on national highway number ten at Meham in support of their demand for compensation. The Haryana Pradesh Congress Committee chief, Mr Bhupinder Singh Hooda said the 'meagre' compensatory amount given would not solve any purpose. He alleged that the state government had failed to convince the central survey team about adequate compensation. He sought compensation of at least of Rs 300 crore. Ms Meena Chaudhary, president of Meham Chaubisi Jansangathan and a Lok Dal leader said nearly 20 villages in Meham region had been affected by the rains and the total loss to the crops and property there had been estimated at over 100 crore. She said the central survey team had witnessed the devastation in various villages and alleged that the union government had ridiculed the sufferings of poor farmers of the region by granting this "insufficient" amount. Meanwhile, BJP leaders are planning to meet their national leaders to pressurise them to increase the compensation amount so that they could approach the farming community in the next election. CHANDIGARH, March 16  The Haryana Government has given a subsidy of over Rs 1.80 crore to small and marginal farmers living below the poverty line for installing tubewells and pump sets under various schemes. A spokesman of the Development and Panchayats Department, Mr Kanwal Singh, today said centrally-sponsored schemes  the Ganga Kalyan Yojana (GKY) and the Command Area Development Authority (CADA)  were being implemented through district rural development authorities in the state. Under the CADA scheme, loan and subsidy were being provided for shallow tubewells, sprinkler sets, underground pipelines and drip irrigation to small and marginal farmers in command areas. The objective of the CADA scheme was to achieve optimum utilisation of irrigation potential in command areas namely Western Jamuna Canal (WJC) Command, Phase I and II, Jawaharlal Nehru Project, Canal Commands of Agra, Gurgaon and Bond, Rewari Lift Irrigation and Dulhera Distributory of the WJC. He said small and marginal farmers were being given subsidy at the rate of 25 per cent and 33.3 per cent of the unit cost for the installation of tubewells. Small and marginal farmers belonging to the Scheduled Castes were being given 50 per cent subsidy. Detailing the progress of the Ganga Kalyan Yojana, he said 192 small and marginal farmers living below the poverty line were given a subsidy of Rs 16.62 lakh against which a loan of Rs 37.54 lakh was also advanced by banks for installing 160 tubewells and 60 pump sets. He said in case of group beneficiaries, the subsidy was admissible at the rate of 75 per cent for the Scheduled Castes, and groups of physically disabled and at the rate of 50 per cent for others. The monetary ceiling on subsidy per group was Rs 40,000. In case of individual beneficiaries, the subsidy was admissible at the rate of Rs 5,000 per acre subject to a ceiling of Rs 12,500 per beneficiary. Under the GKY scheme, 50 per cent of the funds were reserved for Scheduled Castes category, he added. He said a cultivator with a land holding of two hectares or below was termed as a small farmer and a person with a land holding of one hectare or below was a marginal farmer for the purposes of extending loan and subsidy under these schemes. He said besides these schemes, there was a provision for government assistance for dug wells under the Million Wells Scheme. Under this scheme, 100 per cent financial assistance was being provided by the government, he said. FATEHABAD, March 16  The Indian National Lok Dal Member of Parliament, Dr Sushil Kumar Indora has served notice to the Central government under Rule 377 of the Lok Sabha through which the MP has asked the government to provide compensation to those farmers of the state whose crops were destroyed by unseasonal rains. Talking to media persons here yesterday, Dr Indora said that similar compensations had already been provided to farmers in Bihar, Uttar Pradesh, Gujarat and Andhra Pradesh. He said that he had brought to the notice of the Centre that about 11 lakh acres of agricultural land was affected by unseasonal rain resulting in an estimated loss of Rs 2971 crore. He demanded that the government pay at least Rs 757.29 crore as compensation. Besides farmers the government should also give compensation to farm labourers working in grain markets and commission agents as their income had also been adversely affected. Dr Indora alleged that the state government had committed irregularities in its survey of people below the poverty line and demanded that the survey be held afresh by changing the parameters so as to include all eligible poor. He also asked the Centre to start work on a Rs 2300 crore project for eradication water logging. He said in a statement that the fight between top Akali leaders had led to the creation of a separate Shiromani Gurdwara Prabhandak Committee Sikh shrines in Delhi. The Sikhs in Haryana would soon have to start thinking on those lines, he said. Mr Virk lauded the efforts of the Haryana Government promote the cause of the Sikhs in the state. He appreciated the resolutions passed at the Jind meeting of the forum on Sunday which demanded the status of second language to Punjabi in Haryana, representations to the Sikhs in semi-government boards and corporations as per their population, financial assistance to Haryana Punjabi Sahitya Akademi and construction of Guru Teg Bahadur marg in the state. SIRSA, March 16  "All the things that a person needs for survival are covered under the Consumer Protection Act," said the Minister for Food and Civil Supplies, Haryana, Prof Ganeshi Lal. He was speaking at a function organised to celebrate Consumers Rights Day by Setu and the District. Consumers Forum at Deepak Marriage Palace, Rania, 30 km from here yesterday afternoon. Professor Ganeshi Lal called for social responsibility while availing the benefit of the Consumer Protection Act and said, if properly used, Act could be a shield for the consumers. Talking about duplication, he said, the government had enacted this Act to safeguard the consumer against it since the judicial complications dishearten consumers to move court. He said, the Act simplifies the procedure to encourage consumers to come forward against substandardisation and duplication of products. The Deputy Commissioner of Sirsa, Dr Avtar Singh, exhorted the consumers to study the Act and take recourse to it so that companies making inferior and spurious fertilisers and seeds were brought to book. The President of The District Consumer Forum, Mr S.L. Jangra, gave details of the Consumer Protection Act. Mr B.S. Sandhu, president, Setu and SSP, Sirsa, presented a vote of thanks to the participants. Stressing on the role of awareness in the protection of rights, he said, this programme had been organised by Setu to create awareness and assured police help to the consumer. CHANDIGARH, March 16  Teams comprising officers and staff within the jurisdiction of the Commissioner of Income Tax, Panchkula, conducted surveys in Ambala, Yamunanagar, Kaithal, Jind and Sirsa and detected irregular substantial stocks and investments. In one case at Ambala, an assessee, dealing in skins and leather goods, had evaded tax on an income of about Rs 1 crore. Tax on incomes of Rs 60 lakh each was evaded in two cases at Yamunanagar. SONEPAT, March 16  Mr Khairati Lal, a school teacher and a resident of Kharkhauda town in Sonepat district has sent a representation to the President of India, urging him to direct the Haryana Government for registering a criminal case against those responsible for the alleged killing of his 11-year-old son, Ashok Kumar, whose body was sent to his house in his absence on March 13, 1996. The father of the victim has in his representation, alleged that his son was crushed to death deliberately by a two wheeler by the culprits. He has also pointed out that despite the case having been brought to the notice of the Chief Minister and the Director General of Police, Haryana besides other higher authorities during the past three years no action had been taken against the culprits. Instead he had been receiving threats from such persons. The President has forwarded the representation to the Chief Secretary, Haryana, for necessary action. Mr Khairati Lal had also sent a similar representation to the National Human Rights Commission pleading for the registration of a case against the persons involved in the killing. The NHRC had sent a notice to the SSP, Sonepat, directing him to take necessary action within four weeks. The four-week time had, however, expired on March 10. The father of the victim said here today that he had not yet learnt about the action taken by the police. ROHTAK, March 16  Several LPG cylinders worth Rs 30,000 were stolen from the godown of a gas distributor here on Saturday night. It is reported that the thieves removed ventilators to get into the godown and removed an unknown quantity of the cylinders kept in the godown. It is learnt that thefts of the cylinders from the godown is often reported. Residents suspect the idea behind such reports might be to claim insurance benefits. Meanwhile, the police has registered a case under Sections 457 and 380 of the IPC in this connection. In another case registered by the police, a minor girl of Bhurawas village in Jhajjar has alleged that Ranjit also from the same village, tried to molest her in his house. The suspect's wife Asha had taken her to her house.The Balhawas police has booked a case under Section 354 of the IPC. FARIDABAD, March 15The Digambar Jain Sabha has appealed to Muslims of Haryana not to make animal sacrifices on March 29 to mark Id-ul-Zuha because the Mahavir Jayanti also falls on the same day. Mr S.D. Jain General Secretary of the Sabha, called upon the Muslims to respect the feelings of Jains. He thanked the Muslims of Mysore and Bhawani Mandi (Rajasthan) who had decided not to make any animal sacrifice on March 29. Mr Jain reminded that Emperor Akbar had also prohibited animal sacrifice when both the festivals had fallen on the same day during his reign. KARNAL, March 16  The Haryana College Teachers' Union has condemned the use of force on the Punjab and Chandigarh College and University Teachers who were demonstrating in a peaceful manner at Chandigarh to press for the acceptance of New UGC grades. Prof D.S. Dhaliwal, President, of union appealed to the Punjab Chief Minister, Mr Parkash Singh Badal to accept the just demands of the teachers. CHANDIGARH, March 16  The Haryana Chief Minister, Mr Bansi Lal, has stressed upon disseminating and popularising the Sanskrit language with a missionary zeal since Sanskrit is the basis of our culture and a treasure of knowledge. Mr Bansi Lal was speaking at a function organised by the Shri Gyan Kalyan Datavya Nyas in New Delhi. Mr Bansi Lal said the Government of Haryana was taking effective steps to promote Sanskrit and ayurveda in the state. At present there were 300 Sanskrit schools functioning in the state. Besides, 500 government ayurvedic clinics had been made operational for providing ayurvedic treatment, he added. On the occasion, Mr Bansi Lal honoured yoga expert Dr B.K.S. Aayangar. He also presented the Shrimati Chandrawati Joshi Sanskrit Award to the Sanskrit scholar Acharya Ram Nath Suman and Prof Rama Ranjan Mukhopadhyaya and the Shri Shiv Nath Sharma Ayurveda Research Award to ayurved scholar Prof Ram Harsh Singh and Mr Anantanand. These scholars were presented a cheque of Rs 10,000 each, certificates and shawls by the Chief Minister. Speaking on the occasion, Dr Murli Manohar Joshi, Union Human Resource Development Minister and managing trustee of the Shri Gyan Kalyan Datavya Nyas, stressed on the need to develop computer software in Sanskrit for promoting the language.